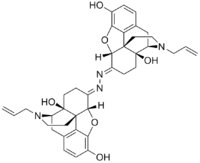 Naloxonazine is a potent, irreversible μ-opioid receptor antagonist. Naloxonazine forms spontaneously in acidic solutions of naloxazone, and may be responsible for much or all of the irreversible μ opioid receptor binding displayed by the latter. 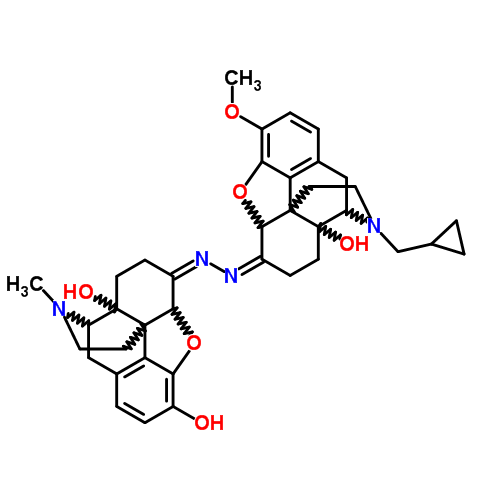 Oxymorphone-3-methoxynaltrexonazine (OM-3-MNZ) a similarly structured opioid also having two complete and mirrored morphinan carbon skeletons but which is a full agonist instead. ↑ Hahn, E. F.; Pasternak, G. W. (September 1982). "Naloxonazine, a potent, long-lasting inhibitor of opiate binding sites". Life Sciences. 31 (12-13): 1385–1388. doi:10.1016/0024-3205(82)90387-3. PMID 6292633. Retrieved 2011-10-18.